Vinicko Kale is a settlement from the late ancient period. Vinicko Kale is located south-western of the town, on left of the river Grdecka, on a hill, and 400 meters above the sea level. All sides are surrounded by high walls except the south-eastern side. It has dimensions 250x150 meters and lies on a 2,5 hectares land. By the researches made it was discovered that the entire living area was not only on this location, but to the other hills, near it. From here there is an excellent view of the town Vinica and the river Bregalnica. 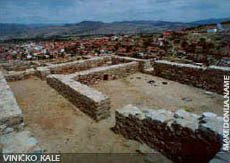 Vinicko Kale is an archeological locality since 1954, its known by the name Gradište and later in 1958 was called Kale Bair. The interest for Vinicko Kale researching calls in the year of 1978 when the an archeologist discovered 5 fragments of terra-cotta icons, by then unknown to the public and with special interest about them. So from 1985 researches are in progress until today. In the beginning they were to protect this ruins, and later systematic. By the researches made and from the items discovered, plenty of them were ceramic, the life in this living area was long period from the Neolithic to the full middle ages. Picture: "Bull - terra-cotta icon from 5th - 6th century"
From the late ancient period were discovered the most monuments. There were discovered walls of some objects, and also characteristics with organized porches, then magicians, built of stone and cement. On several places these building has walls kept until today high 4 meters. In some of them were discovered water installations... These buildings were built by the defensive walls. The defensive wall was built of broken stone with cement and is 3 meters fat. The famous terra-cotta icons were discovered by these walls. "Archangel Michael" - terra-cotta icon from the 5th - 6th century"
In the middle of Vinicko Kale are kept ruins of a little medieval church, before dug out by wild gold miners. Around the church was discovered a big number of samples of architectonic plastic, and in columns, bases, capitels... There was discovered one rich woman's tomb from 12th century, in which were 9 glass 4 bronze, golded jewelry, 11 bronze rings and one subject from bone. "Jošua and Caleb - terra-cotta icon, 5th - 6th century"
The researches that were made in Vinicko Kale proves the temporary falls of this living area. Of course big part in all of that had the main road that leaded to Stobi - Vinicko Kale - Serdika - Pautaliya. On this road by the archeologists were located a couple of towns. And by that we can mention that the ancient towns of Aemonia and Kalenidin can be located on Vinicko Kale.